It is so exciting to see the good stuff being posted about around the web in preparation for the Holidays. 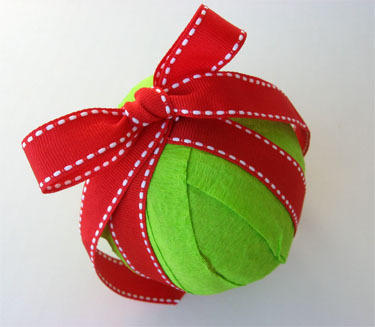 Here are a few of my current faves: Alpha Mom’s Surprise Ball Christmas Ornaments are so wonderful! They remind me of playing hot potato at birthday parties in the seventies (yes… I’m old). 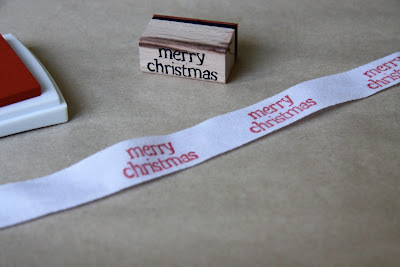 Outi, of white country has designed her own stamped ribbon. Brilliant! 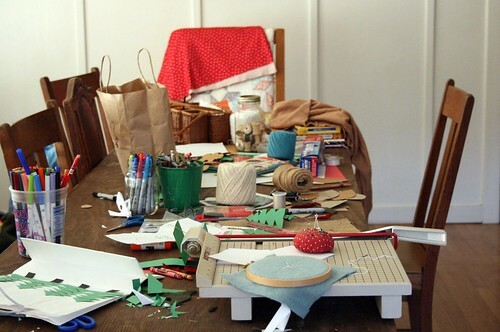 A Foothil Home Companion lays it all out … literally covering a table with craft supplies to let the imagination go where it wants with beautiful results. I’m kicking myself that I never thought to use magazines to make our Danish star ornaments. I love the ones Melissa of Bridgman Pottery has made. And look at these amazing gift bows Ali has shared — also recycling magazines.